In the last two posts I've already outlined what we have coming up in version 3.4, so I will not repeat it here, but you can take a look at our previous two updates. Also, my colleague Giuliano --- aka Useful Apricot --- was jealous of me writing these monthly updates so he started a turf war and launched his own blog: "Behind the Scenes" is dedicated to Wild Apricot product development news (including analysis work, new and notable feature suggestions, etc.). Check out Giuliano's first blog post for a fascinating story about ducks as well as some sneak peeks into functionality being tested for version 3.4. Redesign of the financial management functionality. Stay tuned to see mockups and screenshots from our test versions on the "Behind the Scenes" blog! In my product manager hat (my biggest and most favorite of all of the hats I wear here at Wild Apricot :-) ), I've spent a lot of time reviewing client surveys. Back on January 19th we sent out our semi-annual client survey, and this time around I had a nice crop of 343 survey responses to read and respond to. 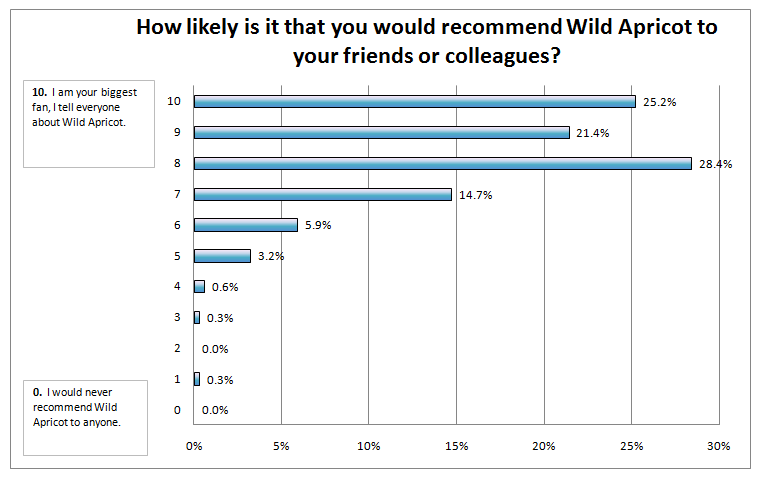 I was very appreciative of many positive things people had to say about Wild Apricot --- and also grateful for all the criticism and suggestions/ideas.This last part is actually the most important reason for doing these surveys --- because many of these ideas then become part of our product Wishlist, then Roadmap, and finally get released. Many of the clients who have contributed their suggestions have seen their ideas come to fruition in our regular product releases over the last few years. I think this is a wonderful tool for my union. Every conference we have I bring a laptop and show local union leaders how easy it is to maintain an online presence. We won a national first place communications award in 2009 for our web presence and use of email via Wild Apricot. I think you guys are doing a terrific job ...its so easy to ask for help and get solution from you and your staff ... the system is very user friendly and most of all, you are always implementing new features and functions into the system which is GREAT!!! Keep up the good job!!! The entire dash board it silly. The site management is a joke. We should have the ability to show what we want, where we want it... 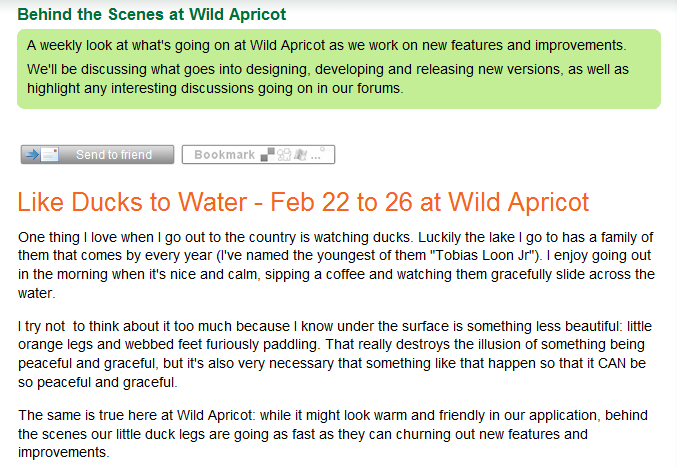 I just really don't like this program, and like I said earlier, as soon as I find a new one, I'm dropping wild apricot. Wild Apricot covers 95% of what we need to do. The other 5% either is in development, on the Roadmap or Wishlist, or available in a workaround. I was AMAZED at how quickly I was able to get the trial website up with some content in order to showcase it to the Board of Directors for approval. One of my co-admistrators has also worked on the layouts/graphics with me with the third administrator acting in an advisory/supervisory capacity. We're very proud of what we've accomplished so far. The most fun I've had doing a website ever! I haven't done too many and I don't speak html, I've just used iWeb and Website Tonight, but yours is by far the easiest. Takes a while to get used to. The customization can be tricky sometimes (with menu colors, etc.). We sincerely thank you for your goodwill and trust, and for your recommendations. We will stick to our commitment to keep improving Wild Apricot, to make it more powerful and easier to use --- a never-ending journey!